First of all, the opening of a diverticle that experiences inflammation, can get so swollen that the diverticle forms a closed chamber. Then bacteria of the colonic flora multiply in there. 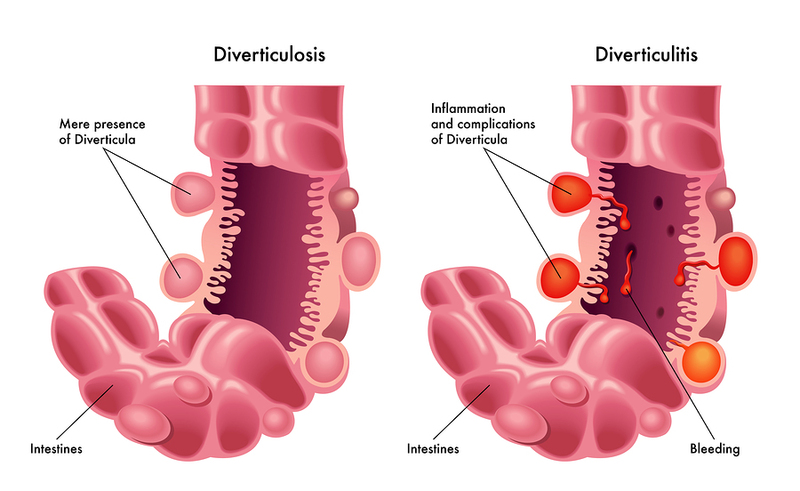 In other words, the diverticle now has an infection, it is a diverticulitis. Finally, this can quickly turn into a diverticular abscess through the action of the E.coli bacteria. In addition, when the wall of the diverticle ruptures this causes acute peritonitis, or how surgeons call it”an acute abdomen”. Fortunately, the patient has mostly a lot of symptoms of pain and a high fever when there is diverticulitis. In a word, the physician treats the patient in the hospital setting with the help of antibiotics to heal the diverticulitis. On the contrary, this avoids the abscess stage and prevents bowel perforation and peritonitis. It must be remembered that most of the time the diverticular disease is ordinarily located in the sigmoid colon (left descending colon). In this case the patient presents with acute pain in the left lower abdomen. Associated with this is usually a fever. 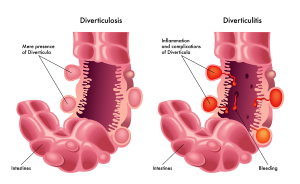 In addition, if the patient had a similar episode before, the physician likely would know that there is underlying diverticulosis and the diagnosis of diverticulitis can then be made fairly quickly. Equally important is that other causes of abdominal pain and fever have to be ruled out. For the most part, these are conditions like acute appendicitis, ovarian cancer or colon cancer to name a few. Occasionally a pericolic abscess can develop with severe chronic diverticular disease. All things considered, in time this can lead to bowel obstruction. Given these points, milder cases are obviously treated with antibiotics at home and repeat evaluation in the office setting. For the most part, more severely ill patients are usually admitted to the hospital and intravenous fluids and antibiotics are given. Whenever the patient is in hospital with an infection, blood tests are also done. Generally speaking, about 2 weeks after the acute phase is over, a Barium enema with contrast can be done. Alternatively the physician can arrange a colonoscopy, if this is available. In either case a CT scan and/or ultrasound may still be necessary to check for a pelvic abscess in case of a persistent fever. In a word, about 80% of patients can be treated conservatively. For the most part about 20% of patients need a surgical excision of the diseased segment of the colon or else a laparotomy to rule out more serious disease. First, a patient with an acute perforation and peritonitis will need the perforated piece of colon removed. In essence, this involves a preliminary proximal and distal colostomy. Second, at a later stage (2 to 6 months later) the surgeon does an end-to-end reconnection. Given these points, the danger after peritonitis is the extensive scarring. In the long run this can in future lead to recurrent bowel obstructions. Frequently the surgeon has to solve this with further surgery again. Mixed into all of this is the constant worry in the elderly patient that sooner or later colonic or other cancers may develop. In the meantime, the physician will always have to do supplementary tests to rule out this possibility.